Its almost spring in the northern hemisphere. Which is kind of a big deal to those of us in the northern half of the northern hemisphere. Like me. Who lives in Seattle. I could further categorize Seattle as lower northern northern hemisphere but maybe I will just call it Baja Alaska. And my point is? Spring around here means that golf season is starting. While people in the upper southern northern hemisphere like San Diego have already been golfing. And eating rolled tacos. We are just starting to hit the courses again. I picked up golf six years ago. I like to play. I am not going to win any tournaments but I have been very successful in losing balls. 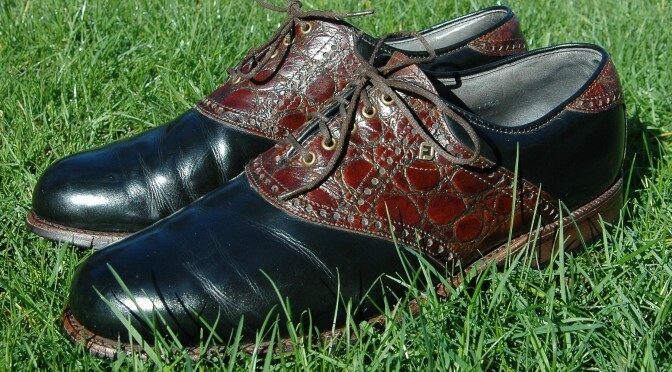 My set of clubs is nice but I have never been happy with my golf shoes. They are a pair of Nike golf shoes that I bought online sight unseen. While there is nothing wrong with the shoes, they looked like I am wearing puffy, misshapen marshmallows. It was time to replace them. 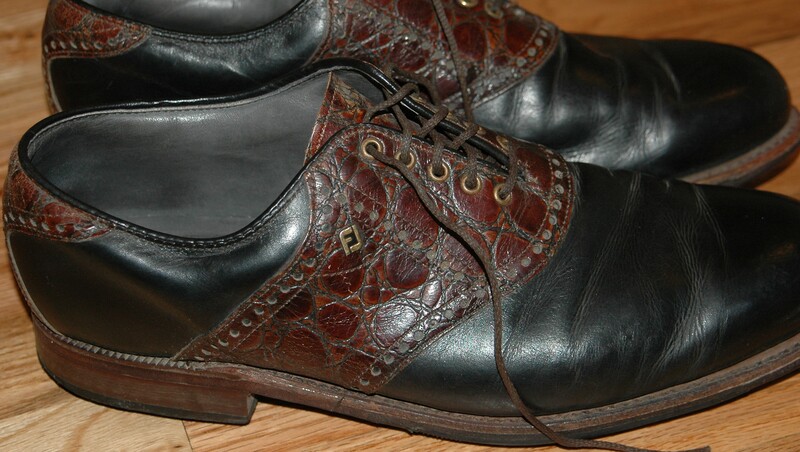 Shouldn’t I have a nice pair of vintage Made in USA golf shoes? Yes, yes I should. I did a bit of research using the Google and decided that FootJoy’s Classics model was the one I wanted. Eventually I bought a pair on eBay and this is how the shoes appeared when I opened the box. Not too bad. The soles needed to be cleaned and many of the spikes were broken. 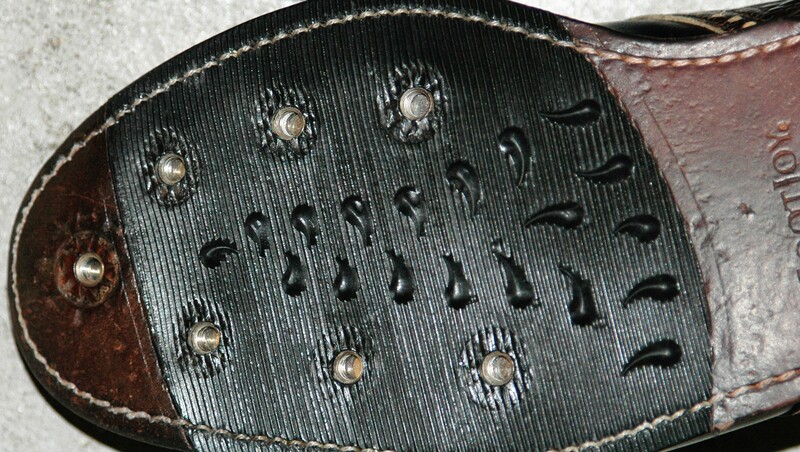 The spikes came out using needle nose pillars. I later bought a spike tool from Amazon. I cleaned the soles with a stiff brush. 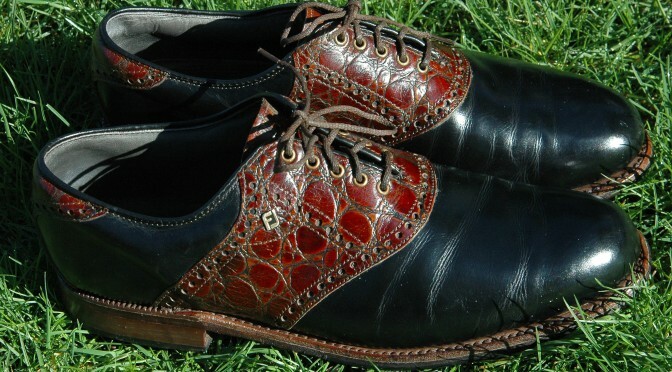 Apparently golf is a popular sport and I found a number of online forums covering many golf topics including shoe care. There were quite a few posts on caring for FootJoy shoes. Most recommended mink oil to maintain the waterproofing of the shoe. 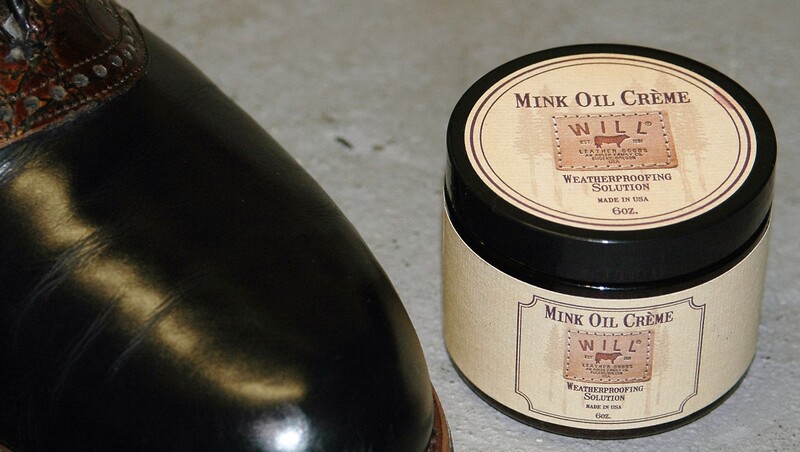 I already had a jar of mink oil from Will Leather Goods so that’s what I used. 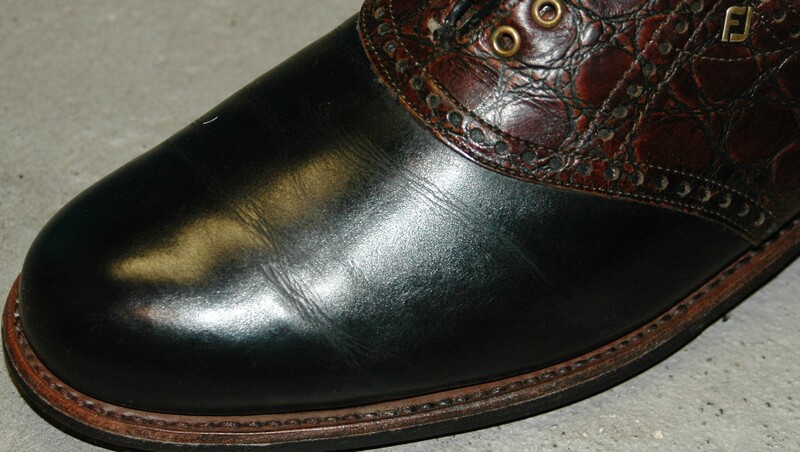 With shoe trees inserted, I worked the mink oil cream into the leather. 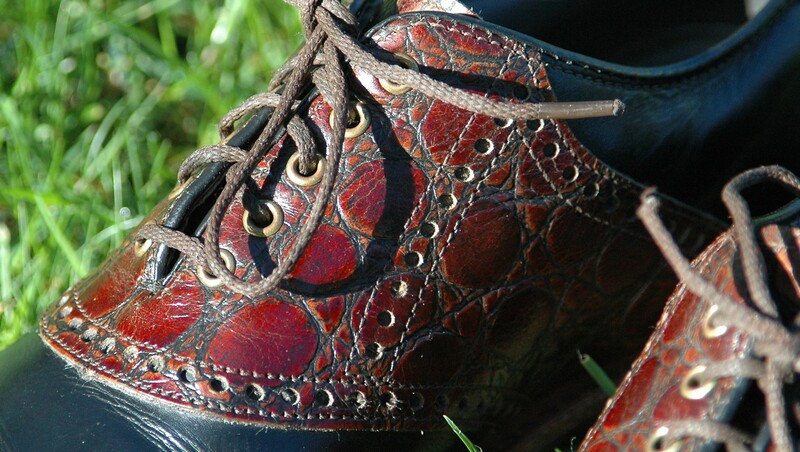 This helped to improve the shape of the shoe and also eased many of the leather creases. I used mink oil on both the leather upper and the leather portion of the sole. 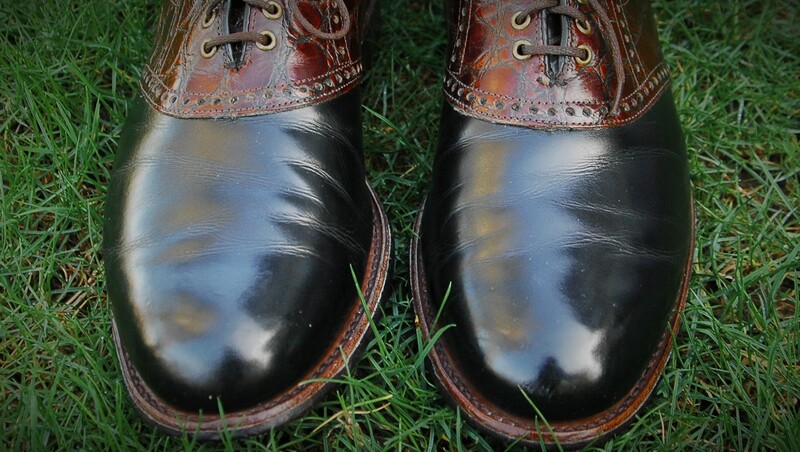 I did one round of mink oil. I might do more rounds in the future but wanted to try them out first. 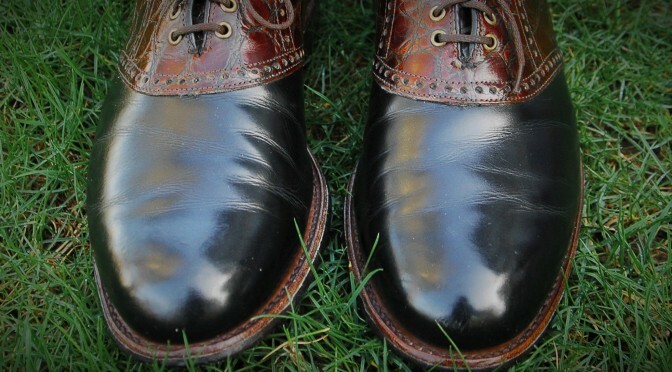 The next day, I polished and buffed the shoes. 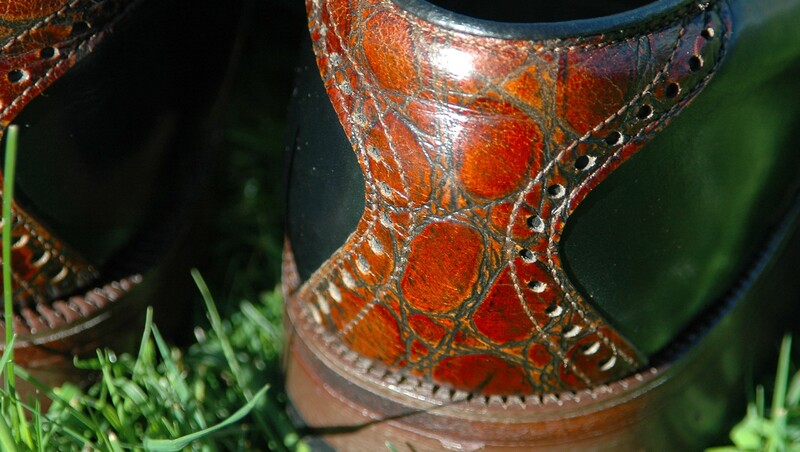 I also used a bit of Sandalwood Meltonian shoe cream on the saddle leather. Much better. Here is the end result. I am not an exotic leather expert but I believe the saddle leather is alligator. 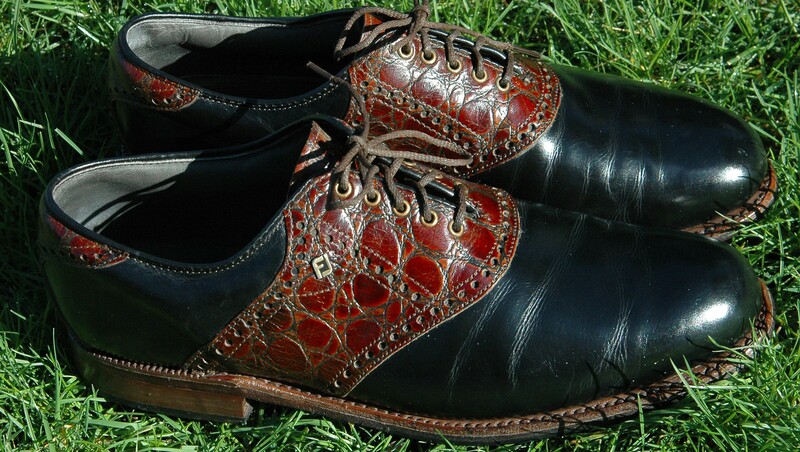 It could be faux alligator but it looks real. 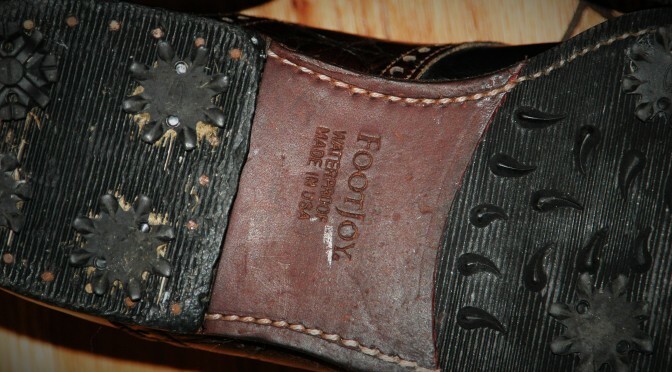 I replaced the cleats with Softspikes Black Widow Classics. 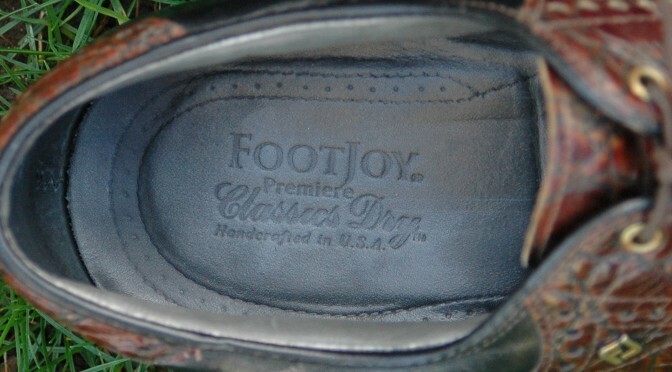 There are a number of types of cleats and these FootJoy shoes require the “small metal thread” variety. 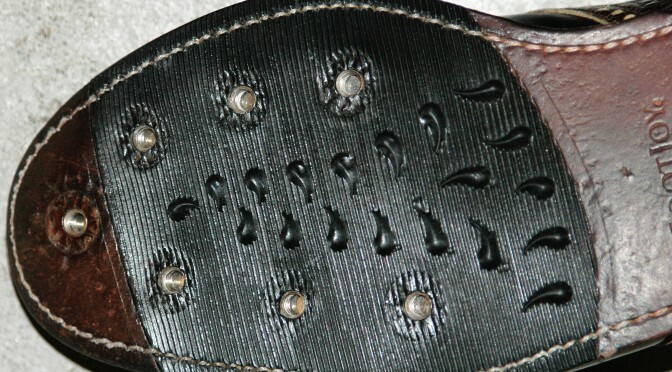 I couldn’t read the model number on the inside of the shoe. I am not sure when the shoes were manufactured but I know they were made before 2009. 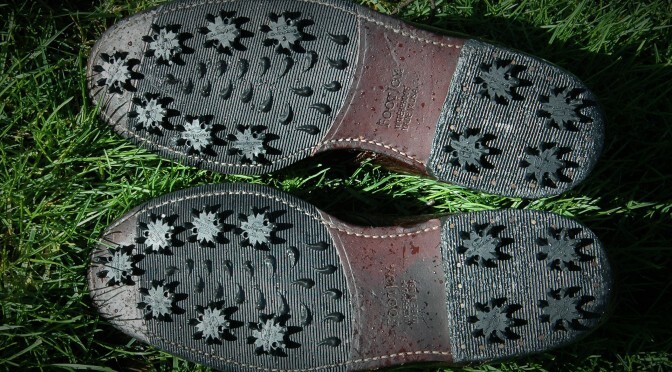 That was last year of FootJoy made golf shoes in the USA. This article explains the end of the line. Which is sad but not surprising. I haven’t played a round in them yet but I have used them on the driving range. They are very nice shoes and comfortable. 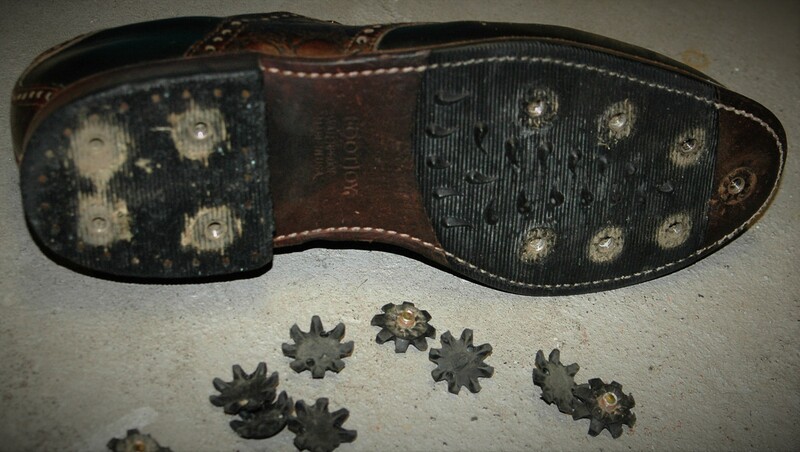 They provide much more traction than the Nikes. I am not sure I love the style but they have grown me. The shoes feel slightly smaller than my Allen Edmonds or Florsheim shoes. So I am going to go up one size for my next pair. Yes, I have already started that search. If you are looking for a pair, eBay has a lot for sale including NOS but there is a lot of competition for them. 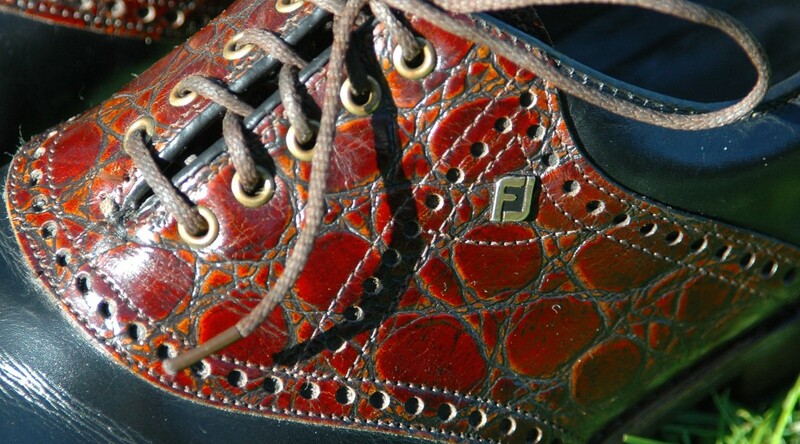 FootJoy produced a wide variety of models and often used exotic leathers so you will have many choices.